In 1994, DESIGN PATTERNS changed the landscape of object-oriented development by introducing classic Solutions to recurring design problems. In 1999, REFACTORING revolutionized design by introducing an effective process for improving code. 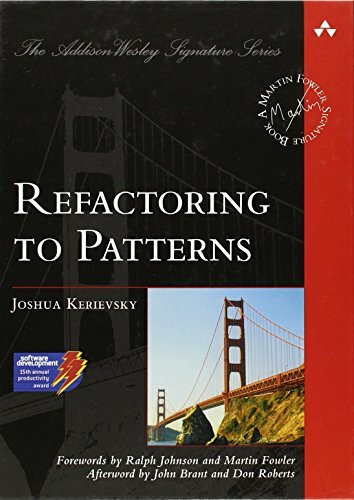 With the highly-anticipated REFACTORING TO PATTERNS, Joshua Kerievsky has changed our approach to design by forever uniting patterns with the evolutionary process of refactoring. This book introduces the theory and practice of pattern-directed refactorings: sequences of low-level refactorings that allow designers to safely move designs to, towards, or away from pattern implementations. Using code from real-world projects, Kerievsky documents the thinking and steps underlying over two dozed pattern-based design transformations. Along the way he offers insights into pattern differences and how to implement patterns in the simplest possible ways. If you have any questions about this product by Kerievsky, Joshua, contact us by completing and submitting the form below. If you are looking for a specif part number, please include it with your message.